Kind of social media- insightful for a fortune cookie, don’t you think? That whole “never listen to stupid people” thing. I thought so. I could spin this into a long post about how the trolls don’t matter, that only your business does, and how it’s in your best interest to ignore them. But then you’d have to invest some additional time hanging out here. Instead, why not just listen when your cookie talks and go do something today that will build yourself or your business? It doesn’t matter who you are. Even the strongest, ballsiest people sometimes delay productivity because we’re afraid of the trolls (especially the dreaded inner troll) and their worthless opinion. What’s that one thing you think about doing every day but never do because of a laundry list of excuses? What keeps you up at night? You don’t have to list it here but it seems silly to keep putting off what you know is right because of something outside yourself, doesn’t it? 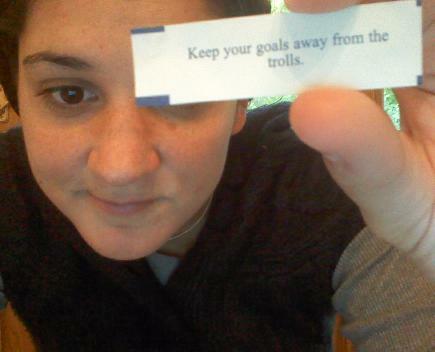 Keep your goal away from the trolls. Because the trolls don’t matter. Your business does. Just something to think about. What the Heck Is A Website Nowadays?